At the Tambopata National Reserve in Peru, nature-loving travelers get to collaborate with scientists studying tiger moths, dodge wild pigs, and get an eyeful of the multicolored macaws that feast nearby. The 217-mile-long Tambopata River winds through the heart of the Tambopata National Reserve. I was stuck in the mud when the wild pigs arrived. It wasn’t just any mud: it was Amazonian mud, in one of the wildest stretches of rain forest a boat can safely reach. I had come to the Tambopata National Reserve, more than a thousand protected square miles in southeastern Peru, on a visit organized by Rainforest Expeditions, a tour operator that owns and manages lodges where travelers can experience the biodiversity of the region while assisting the scientists working there. I was looking at a band-tailed manakin, a bird the size of a teacup and the color of sunset, putting on a show for a prospective mate. It crossed my mind, as I watched the manakin displaying its plumage, that I’d never seen anything more beautiful. 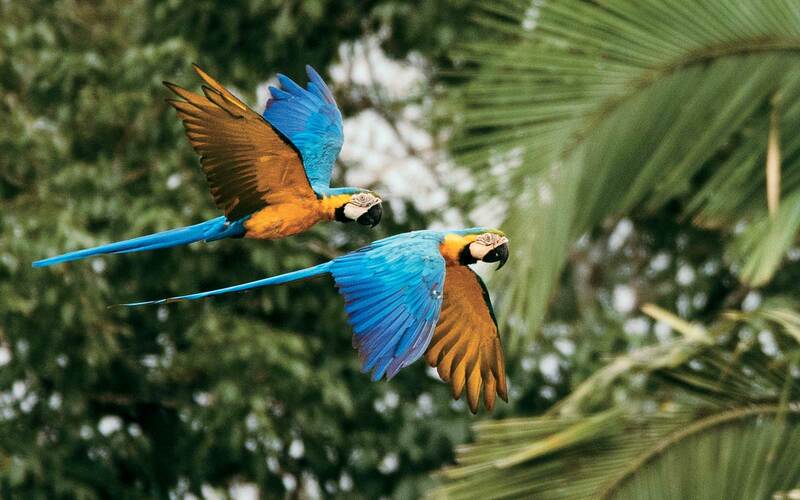 Macaws in the Tambopata National Reserve, an area of protected rain forest in Peru. Then I caught the scent of the pigs. The day before, I had traveled by plane from Lima to the rain-forest city of Puerto Maldonado, where I was met by Silverio Duri, my guide. On the four-hour boat ride from Infierno, an indigenous settlement, to the Tambopata Research Center, the lodge where I would be spending the next two nights, Silverio had cautioned me about the pigs—white-lipped peccaries, to be exact. “They’re generally harmless,” he told me, “but don’t get in the way of a herd. Their tusks are sharp as razors. This tip should have made an impression on me. I quickly forgot it, however, dining on chicken in coca sauce and sipping passion-fruit nectar on my first night at TRC’s newly expanded ecotourism accommodations. The spectacular macaws for which this region is famous distracted me as well, to say nothing of the half-dozen species of monkey whose howls echoed through the forest. Though great care has been taken in the design of the center’s thatch-roofed suites, which have tropical wood floors and décor by indigenous artists, visitors come for the wildlife, and the management knows it. The mosquito netting of my canopy bed was all that separated me from the jungle. Visions of jaguars, which can occasionally be seen in Tambopata, danced in my head until dawn. Now, up to my shins in muck, I remembered Silverio’s warning. The smell of the pigs hit me first: a musty pong that reminded me of certain New York subway cars in summer. By the time the first one came into view, the smell was so overpowering that I felt almost drunk. Silverio whispered to keep absolutely still: he wanted to see how close the herd would come before we spooked them. Very close, it turned out. Suddenly they were everywhere, hundreds of them, grunting and clacking their tusks, flowing around us like a river. Encounters with peccaries, monkeys, capybaras, and other creatures are common in Tambopata, but the reserve is particularly renowned for its clay licks: areas of exposed earth, generally along a riverbank, where a variety of jungle animals gather to ingest clay. The TRC is the only permanent human habitation permitted in the reserve, having been grandfathered in when the area became officially protected in 2000. Biologists had been studying the ecology of the nearby clay licks for 16 years by then, attempting to understand the significance of the greasy pink clay to the metabolism of the monkeys, parakeets, and macaws that risk their lives to feed on it in broad daylight, in plain view of potential predators. The likely answer turns out to be fairly straightforward—the clay is high in sodium and other vital minerals. At feeding time, the sight of hundreds of birds clinging raucously to the riverbank in a fluttering curtain of primary color borders on the psychedelic. Silverio woke me before dawn on my first morning at Tambopata, and we took a boat, with a handful of other ornithologically minded guests, to a wooded bluff a stone’s throw from the reserve’s most famous lick. It wasn’t long before the birds started coming, in a trickle at first, then in a deluge. Gaudy though they are, parrots and macaws are hard to see in the jungle, generally keeping to the higher strata of the canopy, where they look black or gray against the sky. But at the clay licks they crowded against one another like commuters, jostling and screeching between greedy mouthfuls. Sitting comfortably on a folding campstool, feasting my eyes on the spectacle and my stomach on passion-fruit pound cake, I felt as decadent as it’s possible to feel in the middle of the wilderness. Impact-conscious tourism in the Amazon has seen a boom in recent years, but Rainforest Expeditions offers nature lovers an experience few competitors can match: the opportunity to collaborate with a biologist doing cutting-edge work in the field. Through the company’s Wired Amazon series of projects, visitors can use camera traps to study nighttime jaguar movements or drone footage to track the reproductive status of Brazil-nut trees, then follow the project from home and even continue contributing to its database. 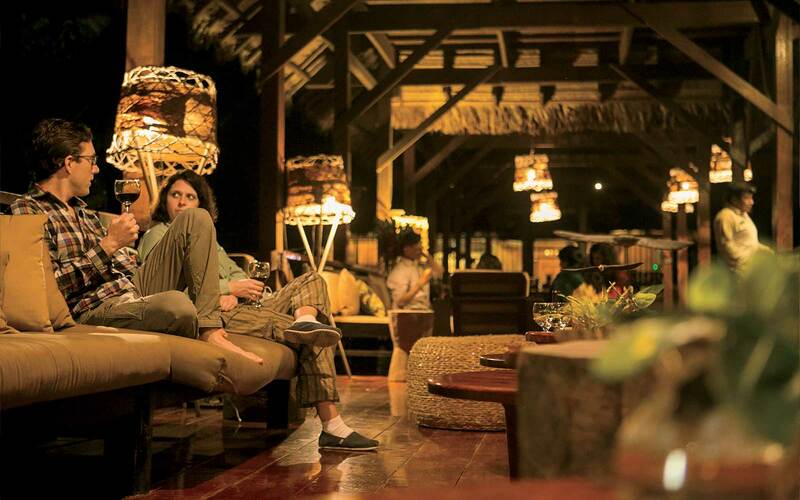 The lobby at Refugio Amazonas, a 32-room lodge that is a hub for tourism-driven research. At the Refugio Amazonas, a Rainforest Expeditions lodge located just outside the reserve, guests can assist Juan Grados Arauco, an entomologist at Lima’s Museum of Natural History, in collecting specimens of tiger moth. They even have the opportunity, should one of the moths prove to be unknown to science, to give the new species its name. I felt slightly inclined to roll my eyes at this, until I was informed that 11 new tiger moths had been recorded in only the past 16 months. Then I wanted to find my own. 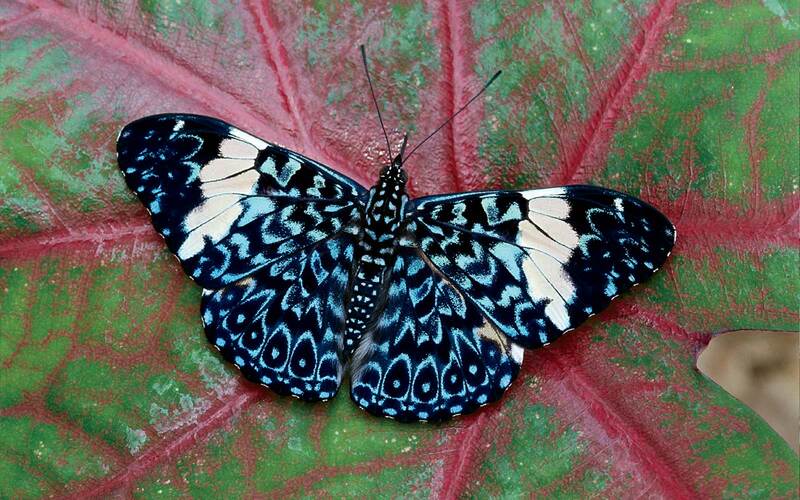 The red cracker butterfly is found throughout South America. The night I worked with Juan, we trooped through the twilit forest in clunky rubber boots to the collection site. We hadn’t been there long before a glossy black projectile hit me heavily on the thigh as I was collecting moths from a “light trap,” which is basically a white sheet hung between trees with a lamp behind it. I was startled to find a baseball-size bug preparing to wage war with my heel. “Rhino beetle!” Juan said, as wonder-struck as I was. He gingerly removed it from my boot and showed me the surprisingly delicate wings hidden under its shell. I’ve had a mild phobia of insects since childhood, but that night I was too fascinated to care. As we continued to gather specimens, some bound for the national collection back in Lima, Juan described watching from the branches of an ironwood tree as a stream of army ants flowed past, devouring everything organic in its path. It’s a testament to his gift for arousing scientific curiosity that I listened with a twinge of envy. It’s a cliché that we travel to forget our mundane lives in exotic locales. But I, for one, travel to recover the past: to be knocked back to the person I was at eight years old, when I hadn’t a doubt that the world beyond our fly-over town was as action-packed and strange as adventure novels made it seem. This inner time travel doesn’t happen often, but my encounter with the peccaries was one such moment. The vast herd thundered past, but didn’t scare off the tiny birds above us. The jewel-like male manakin continued its show on that low-hanging branch, a dot of resplendent calm in all the tumult. I stood rooted in place, catching snatches of its song. Suddenly a fruit bat appeared, its wingspan as long as my arm, startled from its daytime sleep by the arrival of the pigs. It circled us in silent panic, close enough that I could feel the beat of its wings. This was exactly how, as an eight-year-old, I’d imagined the rain forest: a continuous pageant, so teeming with life that there was barely space for one more living creature. Here was the jungle of my childhood imagination, in all its fluttering, grunting, twittering, stinking glory. I may never wash that pink mud off my shoes.